This post brought to you by KRAFT Natural Shredded Cheese and Safeway. All opinions are 100% mine. 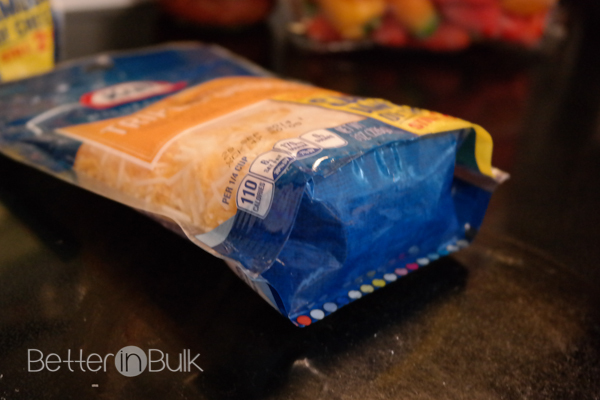 What’s so amazing about the new KRAFT Natural Cheese Stand-Up Pouch? The new stand-up pouch has the same amount of cheese as there was in the old style pillow pack – still 2 cups of yummy cheese! All the same varieties you love are now available in the new stand-up pouch, which makes it easier for scooping (or pouring) directly from the package. I love the new stand-up pouch for cooking! Safeway is converting all of their KRAFT shredded cheeses to the new packaging. I’ve been waiting eagerly for the new packages to come to my Safeway…and they are finally here! The new packages are located right where the old packages used to be in the cheese section, so they’re easy to find. To celebrate the new KRAFT stand up pouches at Safeway stores, I stocked up on KRAFT natural cheeses and made a recipe from KRAFT that I knew my family would devour. And, boy was I right! BRUSH 1 Tbsp. oil onto large sheet of parchment paper. Divide dough in half; place 1 piece on prepared parchment. Roll out to 14x8-inch rectangle or 12-inch round. Repeat with remaining oil, dough and second sheet of parchment. 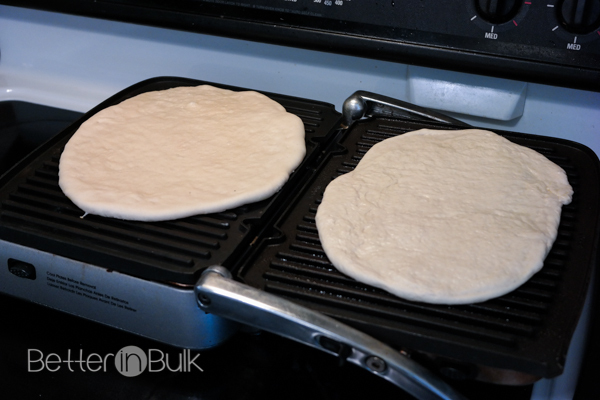 Transfer dough, parchment sides up, to grill; remove parchment. GRILL 2 to 4 min. or until bottoms of crusts are lightly charred. Place, grilled sides up, on work surface. 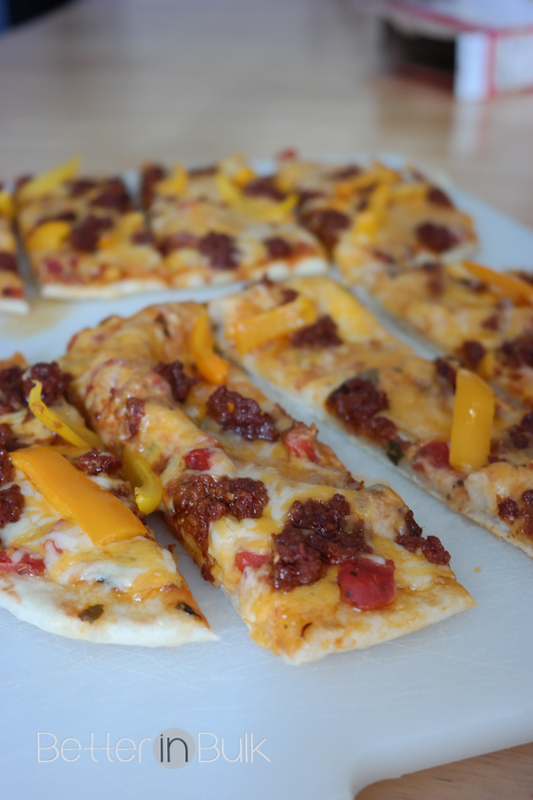 TOP with salsa, chorizo, peppers and cheese. Grill 4 to 5 min. or until cheese is melted. Note: my outdoor grill is currently broken, so I grilled these on my indoor griddler (which is one of my favorite kitchen tools) and then threw them in the oven for a few minutes to melt the cheese. 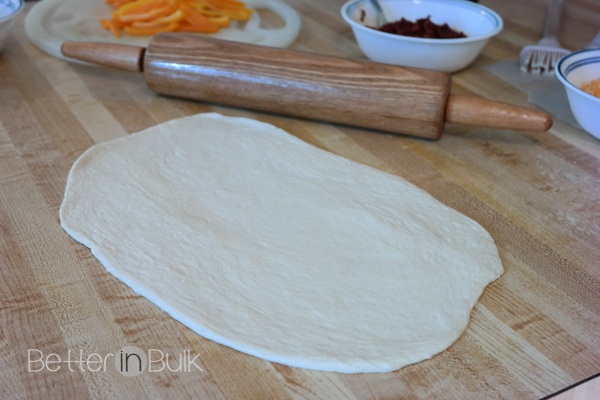 I am totally using this method of making pizza crust again, though! 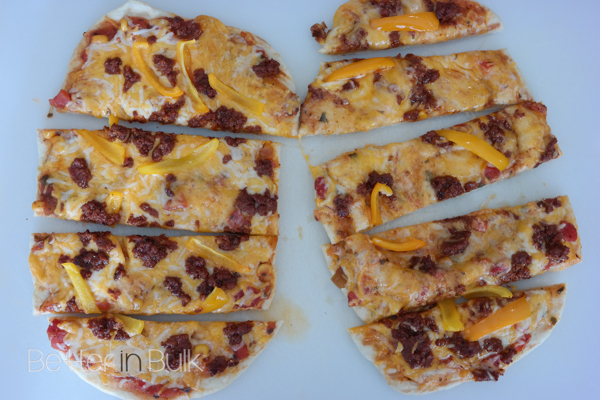 Knowing that the kids would probably prefer a more traditional flatbread pizza, I also bought mozzarella and some pepperoni and made a few pepperoni flatbreads for the kids…but oh my goodness! 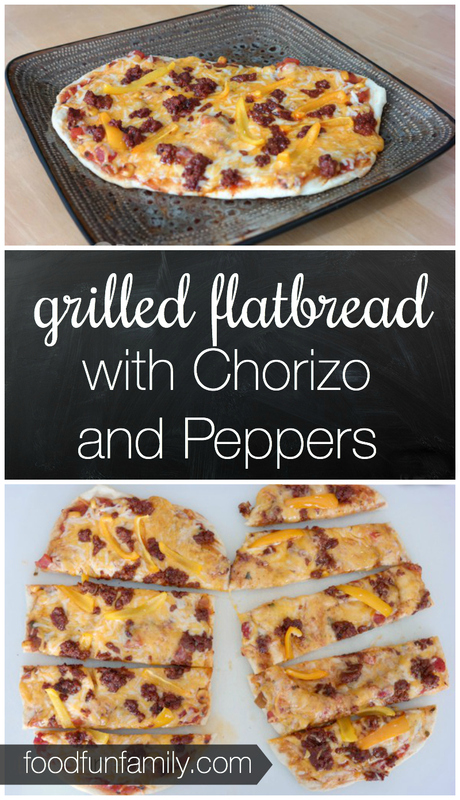 The grilled chorizo flatbread was amazing. 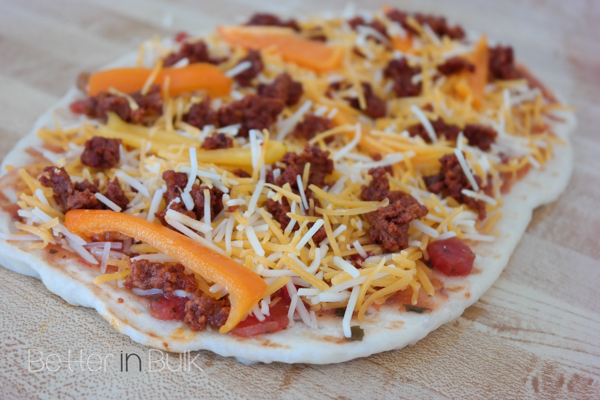 I loved the combination of flavors…the spicy chorizo sausage, the sweet peppers, and the creamy cheese. Mmm! I can’t wait to try some of the other recipes on Kraftrecipes.com with the KRAFT stand up pouches. Which recipe would your family love to try? © 2014 – 2016, Food Fun Family. All rights reserved. Sounds delicious. Is dry cured chorizo different from the ones found in the tubes? Yes, it is different, but I’m sure you could modify and use either type. These look super delicious, not to mention easy! What a perfect quick lunch idea for busy moms with kiddos at home. Thanks for sharing your recipe with us at Merry Monday this week! I love quick and dirty dinner recipes. Thank you! Pinned. Thank you so much for sharing your recipe with us at the Brag About it Link party! We love partying with you! I love cheese too, right out of the fridge or all melty. :) This recipe sure looks delicious. I have never had Spanish Chorizo before.